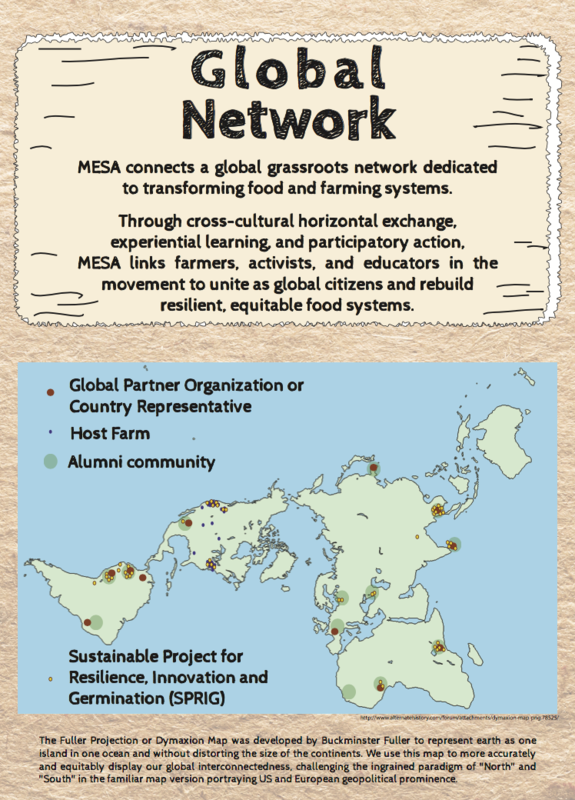 MESA collaborates with a network of organizations that share the values of linking traditional knowledge with innovations rooted in earth stewardship, solidarity economies, and multicultural alliances around the world. Our Global Network includes farms, NGOs, leading grassroots organizations, university programs, social movement partners, small businesses and other organizations that are well-regarded in the fields of sustainable agriculture, agroecology, food justice, farmer training and education, and cultural exchange to facilitate, deepen, and enrich our work. In addition, we are linked to thousands of small-scale farmers, trainees, mentors, and learners as active participants, alumni, and supporters of our programs who are building resilient communities and regenerative food systems around the globe. Experienced farmers, educators, advocates, and activists who host trainees and Stewards, provide trainings and workshops for our in-person or online programs, collaborate on program development, and support partnerships. Become a Mentor. Our dedicated board of directors consists of farmers, nonprofit leaders, food policy advocates, Hosts and Steward Alumni who support MESA program development, support partnerships, advise on strategic planning, provide fundraising, legal, and organizational expertise, and hold fiduciary responsibility for the organization. Join our Board. Individual facilitators of international student exchanges, assisting with the selection of International Exchange Program candidates and obtaining visas. Some are individuals who have previously participated in MESA programs. Learn more about being a Country Representative. Non-governmental organizations, associations, and universities that build capacity among small and sustainable farmers, and who support the International Exchange Program and alumni projects. Learn more about being a Global Partner. Farms, nonprofits, sustainable food suppliers, and education and research centers who host Stewards and Trainees as interns. Hosts provide Stewards with mentorship and supervised training in production, distribution, marketing, education, research and/or community organizing. and are committed to horizontal, cross-cultural learning exchanges to grow sustainable food systems. Be a Host. Students, farm interns, trainees, apprentices, and beginning farmers everywhere! Learners take online courses on our Farm-Centered Learning Network and participate in our workshops and events. Aspiring or established farmers, students, researchers, activists, and advocates from around the world who participate in our farmer training programs: the International Exchange, Seed Internship, or Bay Area Farmer Training Program. Individual members, donors, corporate sponsors, foundations, and public funds that support and sustain our work. Become a Supporter today! Individuals who support and supplement our administrative work in exchange for nonprofit experience, exposure to the global food movement, and regular goat cheese and chocolate. If you would like to collaborate with MESA in any of these roles, please contact us to get in touch!